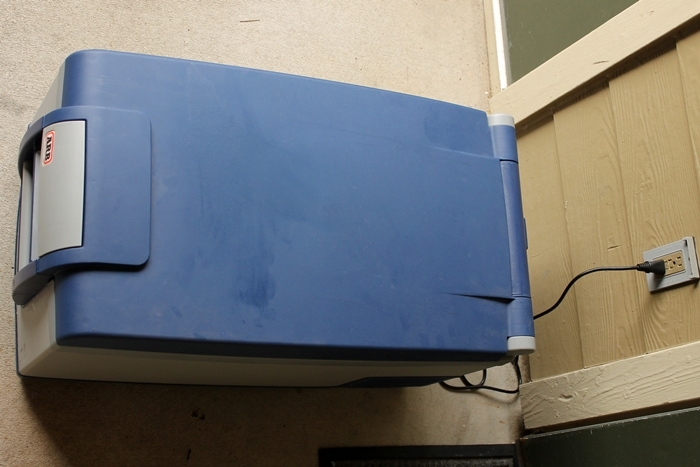 It’s more than a cooler though – it’s a portable fridge. No more fussing with ice. Yay! That means no soggy food. No worrying about whether the ice has melted or about where you are going to find more. No more frustrations over not having enough room when it’s full of ice to having everything falling over and rolling around when it melts. You do need power. Which I suppose in some situations isn’t always available but when it is this rugged monster is a gem. It operates on 12/24 volts DC or 120 volts AC and comes with two power cords, one for AC (inside your home) and one for DC (cigarette lighter.) It also has built-in battery protection so you won’t run your vehicle battery too low. Awesome. Why am I telling you all this? Because I think this is a pretty cool product and I like to share. A sort of ‘pay it forward’ by telling others when we come across great products. Why do we have one? We knew at the end of hunting season last year that we needed to replace the cooler we had been using. 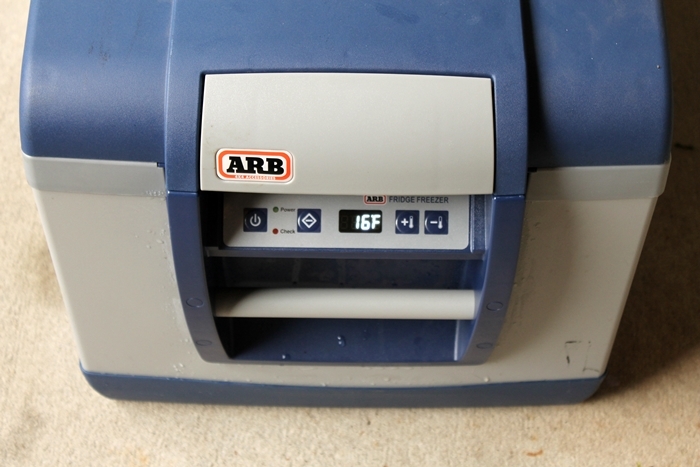 So Don spent a lot of time researching coolers and after many youtube videos and other reviews he was set on the ARB. It comes in 4 sizes; we bought the 60L (or 63 quart size.) For $945. I KNOW. Crazy! Well, it turned out to be worth every penny. If you aren’t squeamish and look close, you can see the ice crystals on the sides. Shortly after the hunting trip, we were locked out of our garage, due to a faulty opener, and subsequently locked out of our upright freezer as well. It took the apartment complex three weeks to replace the garage door switchboard and for us to gain access again. I don’t know how we would have gotten by without the ARB. Our household freezer was already 3/4 full before Don went hunting. 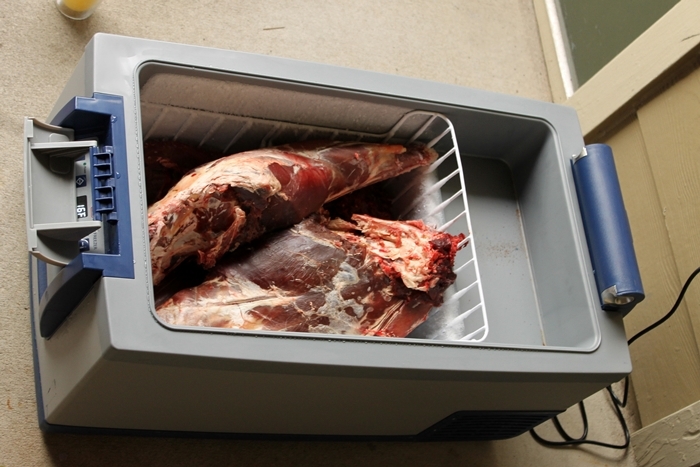 So, after we processed and packaged the venison it went back into the ARB freezer until we could access our garage again. Money. Well. Spent. Quiet operation – you don’t even hear it! A drain plug on the bottom for easy cleaning. Easy to use digital display for setting and monitoring the temperature. We were a little overzealous with the temp not knowing how low we needed to go. In the interest of full disclosure, it is a little heavy and bulky for one person – in this size. I’ve been able to move it around the house by myself, empty, but at 54 lbs with handles far down on the sides, it is a little awkward. When full, it’s pretty much out of the question for one person to move it. 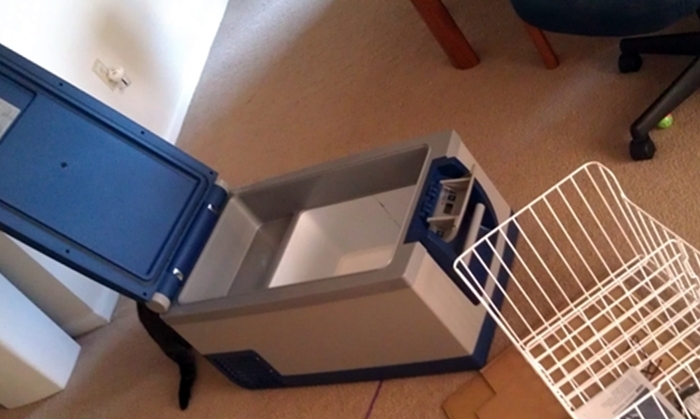 But what huge icebox can be moved by one person when filled with ice and/or food? Everyone that you meet knows something you don’t. Learn from them. Share your experiences.